LOGS, the Ladies Ordinariate Group, went on pilgrimage to Littlemore this week - the small village just outside Oxford where, some 150 years ago, John Henry Newman was received into full communion with the Catholic Church. Newman had been vicar of the great University Church in Oxford, but then moved to Littlemore, where he built a church and school for the local people, and turned a set of old stables into a place of retreat for himself and his companions - it was here that he was received into the Catholic Church by Blessed Dominic Barberi. The LOGS group prayed in Newman's chapel, and were given a tour of his library and the church. "An unforgettable day - a place of such peace and prayer - we'd like to make this an annual pilgrimage". Mgr Keith Newton came to the Most Precious Blood on Sunday February 9th to administer the sacraments of Baptism and Confirmation at the 11 am Sung Mass. The Confirmation candidates have been studying since October, and have been using the "Anchor" programme produced by the Dominican Sisters of St Joseph, based on the Catechism of the Catholic Church. Candlemass was celebrated in style at the Church of the Most Precious Blood. A great stack of candles - to be used for sanctuary lamps, votive lights, the altar, etc in the year ahead - were blessed at the 11 am Sung Mass. Each candle has been funded by a member of the congregation so that it will burn for a special intention. The children's procession to their Sunday School, which always takes place during the Gloria, saw the children all carrying their glowing candles as they followed their processional cross up the aisle through a candlelit congregation. For the feast of the Epiphany, pieces of chalk were blessed and distributed at the end of Mass at Precious Blood Church, and members of the congregation took them home to use in blessing their homes and chalking up the initials 20+C+M+B+14 above their front doors. The initials stand for "Christus Mansionem Benedicat" - "Christ blesses this House" and also for the names traditionally given to the three wise men, who came to worship the infant Christ: Caspar, Melchior, and Balthasar. "God of Heaven and earth, you revealed your only-begotten One to every nation by gthe guidance of a star. Bless this house and all who live here. Fill us with the light of Christ, that our concern for others may reflect your love. We ask this through Christ our Saviour. 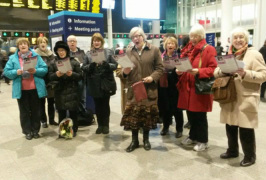 Men"
London Bridge station rang with carols in the run-up to Christmas, with carol singers from our Ladies Ordinariate Group (LOGS). 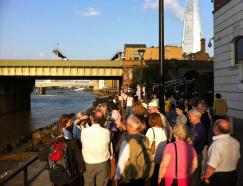 Standing on the station’s main concourse, the LOGS choir filled the busy station with music – London Bridge has literally millions of commuters passing through each week. The LOGS choir – with members from Precious Blood along with the Croydon and Central London Ordinariate groups – gave the crowd all the popular carols “O come all ye faithful” “The first Nowell” “Away in a manger” “We three kings” and more. There was a great response with lots of goodwill and the carol-singing looks set to become an annual fixture. Afterwards, the singers gathered at Precious Blood for some well-earned mulled wine. Funds raised from the singing will go to help those in need via various charities supported by the parish. This parish of the Precious Blood is in the care of the Ordinariate of Our Lady of Walsingham. The Ordinariate was established for groups of Anglicans coming into full communion with the Catholic Church, and bringing traditions with them. The Catholic Church has now agreed an Order of Mass that recognises these traditions. It is the Ordinariate Form of the Mass. We used it for the first time in Precious Blood Church on Thursday of this week. The remembrance of them is grievous unto us, the burden of them is intolerable. Gather up the crumbs under thy Table. Our Thursday evening Masses here at Precious Blood will now always use this Ordinariate Form. Come and discover it! In many ways, it will not seem so very different from the form of Mass that is used every day – but you will notice these old and beautiful prayers and the formal language, and the particular sense of structure that these bring. And tell your Anglican friends about it all: the whole point of the Ordinariate is to make a bridge between Anglicans and Catholics, a bridge over which Anglicans can cross so that they can be part of the Catholic Church. On Thursday evening, we have Evensong before Mass. This too is an Anglican style of worship, although it has Catholic roots. It is the Evening Prayer of the Church and includes psalms, readings, and hymns. Praying Evensong together as the darkness falls outside, and the church is glowing with warmth and light, is a good way to finish a busy working day. 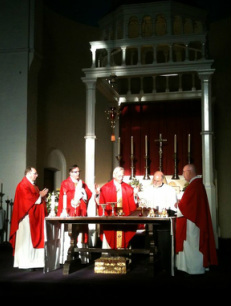 Here at Precious Blood parish we are privileged to be part of the Ordinariate of Our Lady of Walsingham, building on the strong traditions of a thriving parish that has been here for over a hundred years…and in a corner of London where Catholics have been celebrating Mass and praying together for well over a thousand years! 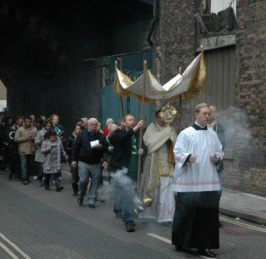 The message of the Year of Faith was taken out into the streets of London on the Feast of Christ the King, with a Blessed Sacrament procession through the streets. Fr Christopher carried the Blessed Sacrament in a monstrance under a canopy held by four men, and was followed by a large crowd of parishioners, including Sunday School children wearing home-made crowns bearing the words carrying messages of love to Jesus and studded with glitter and decorations. In front of the Blessed Sacrament, an altar servers rang a loud bell, and incense swirled as acolytes carrying candles walked each side of a large processional cross. Volunteer stewards kept the procession moving along, and things finished with Benediction back at the church. A bright sunny Autumn day made for perfect procession conditions. After Benediction, there was a gathering in the parish room for a celebration buffet and drinks. 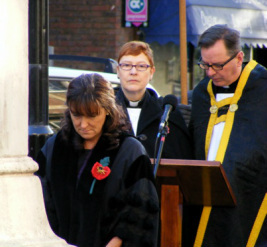 The Rector, Father Christopher Pearson, led the Remembrance Sunday service for the Borough of Southwark this year, as it took place at the War Memorial in Borough High Street, which lies within our parish. It was a traditional service, beginning with “O God our Help in ages past” and including the Last Post and the Two Minutes Silence followed by “They shall grow not old…” which was read by the Deputy Lieutenant, Mrs Jenny Bianco. The Mayor, Councillor Abdul Mohammed, then led the laying of poppy wreaths at the foot of the War Memorial, and we had prayers, finishing with the Lord’s Prayer. The final hymn was “I vow to thee My Country” and then after the Blessing all sang the National Anthem. It was an exceptionally beautiful Autumn day, a blue sky and crisp fresh air. After the service finished, the Cross bearer, altar servers and churchwardens led parishioners of Precious Blood back to the church for Mass – a Requiem Mass, celebrated by Father Scott Anderson. Members of Precious Blood parish took part in the “Two Cathedrals” Blessed Sacrament Procession from Westminster to Southwark Cathedral at the weekend (Oct 12th). 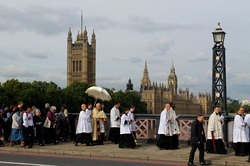 The Blessed Sacrament was carried in a great procession from Westminster Cathedral, across Lambeth Bridge, and through the streets of Southwark to finish with Benediction at St George’s Cathedral. Along the way, hymns were sung and the Rosary was said. Southwark Cathedral was packed for Benediction, which finished with a rousing “Salve Regina”. The Procession first took place in 2011, to mark the first anniversary of the visit to Britain of Pope Benedict XVI and the beatification of John Henry Newman. It was such a success that it was repeated the following year – and now again. It looks set to become an established tradition. The parish of Precious Blood now has an unusual link with a VI form college. Parishioner Joanna Bogle was involved in helping at a conference held at Aquinas College, Stockport, organised by a friend, Louise Kirk. The conference was for parents, teachers, clergy and others, sponsored by the diocese of Shrewsbury. Afterwards, they stood in the College's impressive new entrance hall, and as Joanna explains: "We were so grateful for the College's wonderful welcome, and we felt that the entrance from the car park to the great modern hall needed something: we said a prayer, and asked that somehow we might be able to get a crucifix or something similar for them. It was quite spontaneous, almost an odd thing to do - but somehow it seemed important". 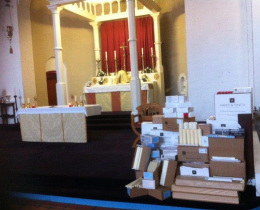 A few days later, at Precious Blood Church, an old broken crucifix was unexpectedly found amongst various other items during a parish tidy-up. Wanting it to be put to good use - and the church and Rectory having no need for it - Father Christopher put it in the hall with the thought that the right home would be found. 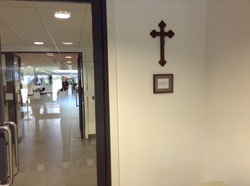 Joanna saw it there and asked about it - and now, mended and restored by Father Peter Andrews, it is hanging in Aquinas College, with a plaque beneath it in which is hidden a short note telling the story of how it came to be there. Joanna and Louise were invited to the College to make a formal presentation of the Cross at a morning assembly. "It all fits together - a prayer answered. Sometimes God just arranges things like that." On Saturday 27th July, Fr Scott Anderson, a member of the Parish of the Most Precious Blood, and the London (South) Ordinariate Group was ordained Deacon along with three other members of the Ordinariate, at the Church of the Assumption, Warwick Street. In his homily, Bishop Richard Moth, Bishop to the Forces, said "These men have come to this moment from very different places, but now they are joined in God's service to His Church." It is with great joy we are able to say that Scott Anderson is to be ordained Deacon on Saturday 27th July at the Church of the Assumption of Our Lady in Warwick Street, at 12noon. He will be ordained a Catholic Priest in the Autumn to serve in the London (South) Ordinariate Group. He comes with a breadth of experience of ministry, having been a priest in the Church of England for almost 40 years. He was trained at Kelham by the SSJE Fathers, and served in various parishes in Sheffield and London. He himself has trained many curates in the CofE, some of whom are (or soon will be) Catholic Priests. He will be a valued addition to the growing team at the Most Precious Blood, The Borough. Please continue to pray for him. May John Henry Newman and Our Lady of Walsingham pray for us! 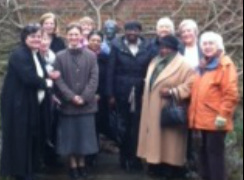 Mass, a Rosary at a garden shrine, and a walk by the sea...members of LOGS, the Ladies Ordinariate Group based at Precious Blood Church, joined with members of the Association of Catholic Women for a day at the Southwark diocesan Vocations Centre at Whitstable. Father Stephen Langridge celebrated Mass for the group in the newly-restored chapel at the Centre, and after lunch - prepared and served by Fr Stephen and his team - there was a tour of the centre and a presentation of its work. The Centre runs courses for young men discerning a call to the priesthood: numbers are steadily rising and a large group of young people recently went to Rome to meet Pope Francis as part of a great gathering of seminarians, novices and members of religious orders from across the world. The celebrations for the patronal feast at Precious Blood church began with a Mass on Monday July 1st, celebrated by Mgr John Broadhurst, with parish priest Father Christopher Pearson and various visiting clergy. Guests from various Ordinariate groups and other friends joined parishioners for the Mass, with music from the parish choir led by organist Christopher Smith. Afterwards celebrations continued with "a glass of fizz' in the parish room. this coming Sunday (July 7th) will see a sung Mass celebrated by the Ordinary, Mgr Keith Newton, at 11 am, which will be followed by a parish barbeque lunch, and on Monday there will be a History Walk round the area, starting outside Precious Blood Church at 7pm and including famous sites such as the Bishop of Winchester's palace, the Clink Prison, and the Globe Theatre. The TV presenter Raymond Arroyo of EWTN, came to Precious Blood Church on Thursday, June 20th. He spoke about EWTN and Mother's Angelica, and the beginnings of the Global Catholic Notwork. As the the author of a New York Times bestseller, the biography of Mother Angelica, he spoke with first-hand authority to and enraptured audience. EWTN arrives at the Church of the Precious Blood! 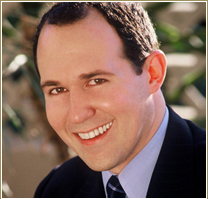 The TV presenter Raymond Arroyo of EWTN, the USA-based international television network, will be coming to Precious Blood Church on Thursday, June 20th. He will give a talk on “Life at EWTN – the other side of the camera” at 6.30pm. All are invited to come and hear the inside story of this famous television network – started by American nun Mother Angelica in a garage and now a worldwide popular TV network reaching millions. Raymond Arroyo has plenty of stories to tell: he is the author of a biography of Mother Angelica, he has interviewed, among others, Cardinal Ratzinger( later Pope Benedict XVI and now Pope Emeritus), and has reported major Catholic events from Rome and elsewhere. The evening will include a glass of wine and light refreshments. The Archbishop of Southwark came to the Church of the Most Precious Blood at London Bridge on Trinity Sunday to make history. He was there to bless the shrine to Blessed John Henry Newman. The shrine, with a portrait of Newman – a copy of the famous Millais portrait in the National Portrait Gallery – is in a side-chapel to the left of the main sanctuary as you walk up the aisle of the church. Archbishop Peter Smith celebrated the 11 am sung Mass, with a large congregation. 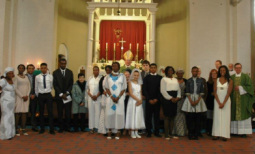 The concelebrants were Father Christopher Pearson, parish priest, and Father Peter Andrews. Newman’s hymn “Firmly I believe and truly” was among those sung. As Mass ended, the clergy approached the Newman shrine where the Archbishop led a prayer of blessing and sprinkled it with holy water. There is a candle-stand, and a prie-dieu with a prayer for Newman’s intercession. The children from the Sunday School presented the Archbishop with a miniature hand-made Bishop, created by themselves out of card and materials, and complete with mitre and crozier. They also showed him – and the congregation – the work they had done on studying the Trinity. After Mass, the Archbishop met parishioners over coffee in the parish room and courtyard. The week-long celebration of Blessed John Henry Newman began at Precious Blood church on Monday with the arrival of a portrait of Newman, for the new shrine which is to be established in the church. 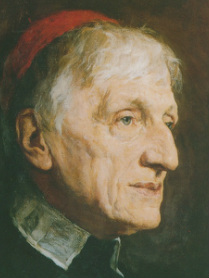 The picture is a copy of the famous Millais portrait in the National gallery, depicting Cardinal Newman in his red robes. The shrine is in an alcove to the side of the main sanctuary. Dr Andrew Nash launched the week with his lecture on Newman’s life and work, given to a large crowd in the church on Monday evening (May 20th). 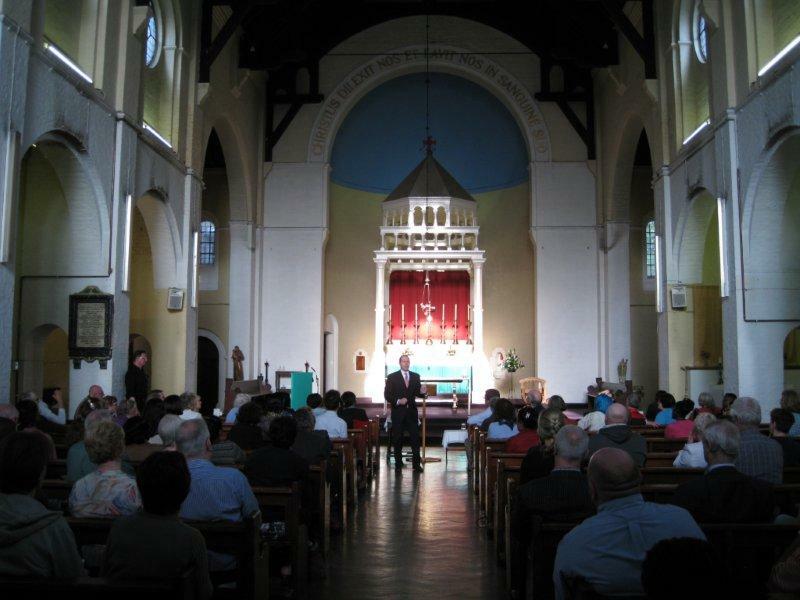 The lecture – illustrated with photographs and sketches of Newman on a large screen set up in the church – told the story of Newman’s teenage conversion experience, his work as an Anglican minister and his huge influence on the Church of England, the Tractarian movement, his conversion to Catholicism, and his establishment of the Oratorians in Britain. People came to the lecture from across London and from further afield, and were welcomed with champagne at the entrance to the church, where a display about Newman’s life was set up and will remain for a week. The display, from the Communion and Liberation Movement in Oxford, describes Newman’s life and his continuing importance for the Catholic Church. Joanna Bogle, a member of the London (South) Ordinariate Group and regular worshipper at the Church of the Most Precious Blood has been made a Dame of St Gregory. The news came in an announcement from Archbishop's House, Southwark: as one of his last acts as Pope, Benedict XVI appointed Joanna Bogle as a Dame of St Gregory. Congratulations to her on this wonderful recognition of her tireless work for the Catholic Church. The parish of the Precious Blood, Borough, London Bridge, held its Annual Parish Meeting last week, establishing a new tradition. 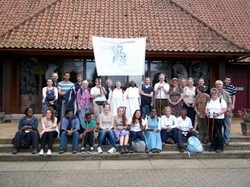 An annual meeting for all parishioners is part of the Anglican Patrimony that the Ordinariate of Our Lady of Walsingham brings. 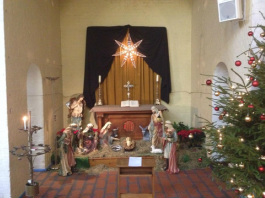 There were reports from the choir, Sunday School, FIrst Communicants, church cleaning team, LOGS (the Ladies Group), and the Legion of Mary, and discussion about future plans for the parish including further cleaning and renovation of the church, and summer activities including a May procession and plans to mark the Feast of the Precious Blood in July. "It was a good meeting" said parishioner and Ordinariate member Lesley West "It was great to see parishioners whose families have been part of the Precious Blood community for years, and Ordinariate members who have been involved for a much shorter time, all joining in together. There is a good sense of community. And no one was in a hurry for it to end - anyone and everyone could have a say on any topic, and then talk continued over coffee afterwards. " A longstanding member of the congregation at Precious Blood Church, Joseph Murphy, who works at nearby Guys Hospital, has been commissioned as an Extraordinary Minister of Holy Communion in the parish. The commissioning ceremony involves a short question-and-answer dialogue in which the duties and responsibilities of an Extraordinary Minister of Holy Communion are explained, and the solemnity and reverence surrounding the Blessed Sacrament are emphasised. Joseph has now taken up his duties, which include not only helping with distributing Holy Communion at Mass but also taking Holy Communion to the sick and housebound. The Life and work of Bl John Henry Newman is the subject of a special illustrated talk on May 20th, at Precious Blood Church, London Bridge. 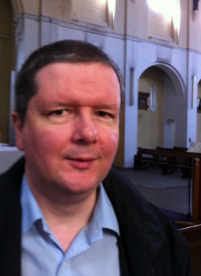 Dr Andrew Nash will give a talk at 6.30pm, in the parish room in the rectory. The evening is organised by LOGS, the Ladies Ordinariate Group. All welcome. Light refreshments. Dr Nash is a former deputy headmaster and head of English at the Oratory School, near Reading, which was founded by John Henry Newman in the 19th century. He is the editor of the current edition of Newman's Lectures on the Present Position of Catholics in England (Gracewing Publishing). Holy Week 2013 began in style for the parish of Precious Blood, with a procession through the streets, starting at the local Catholic primary school. The Palm Sunday Procession is an important tradition in the worldwide Church, and commemorates Christ entering Jerusalem at the start of the events that were to lead up to his Passion, death, and Resurrection. This particular Palm Sunday also marked a new landmark in the parish, with the launch of a new Sunday School for children, at the 11 am Mass. On the evening of Holy Thursday – Maundy Thursday – the congregation gathered for the traditional Mass of the Lord’s Supper, including the ritual of the Washing of Feet. At the end of Mass, the Blessed Sacrament was taken to the candlelit Altar of Repose. During the hour that followed, there was silent prayer, interspersed with Scriptural meditations given by the parish priest. On Good Friday, members of the parish took part in the Walk of Witness in which a cross is carried through the local district, stopping at set points for public prayer. In the afternoon, the Stations of the Cross were held in the church, and then at 3pm came the most solemn and important part of the day, the commemoration of Christ’s Passion. 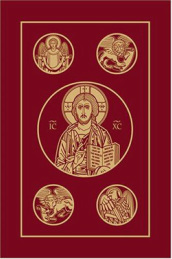 The Gospel account was read aloud in traditional style, the Cross was venerated, and Holy Communion was distributed. Children at Catholic and Church of England primary schools across Greater London have been taking part in a project organised by women in the Ordinariate of Our Lady of Walsingham. 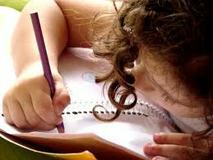 The "Children's Handwriting and Artwork Project" is believed to be the first of its kind. The aim was to encourage children to study and enjoy the beauty of the psalms. Every Catholic and Church of England primary school in Greater London (Anglican diocese of London and Southwark, Catholic dioceses of Westminster, Southwark, and Brentwood) was invited to take part. The children were invited to choose a psalm from a list provided, and to copy out a few lines illustrating it in any way they liked with drawings, collage, etc - and then, in a short paragraph, to give reasons for the choice. The entries for the project will be judged during the Easter holiday period, and prizes presented in the summer term. "We have been touched by the really beautiful work that children have sent in" said Mrs Kathie Kempton, of the Ladies Ordinariate Group. "They especially loved the psalm that talks about the deer longing for cooling streams, and others that spoke about the wonder of nature. The standard of work has been very high. We were given a small grant from an ecumenical charity to enable us to run this project, and are most grateful for this generosity, which means we can award some prizes, and a little memento to each child who has taken part."